All-American College Football is a fun, little-known American football game developed by Micro Sports and published by IBM, back when the PC giant was aggressively entering the PC game market (and from which they would withdraw years later). A follow-up of sorts to the earlier game NFL Pro League Football, All-American College Football tweaks the engine and applies it on college football. The result is a solid, albeit a little "dry", football game that is well worth a look by fans of the sport. 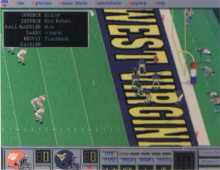 Similar to Konami's largely forgotten NFL Pro Football, All-American College Football tries to combine basic coaching options with multimedia elements to enhance the package. Most of these bells and whistles work quite well, although some are more redundant than useful. Some of the more innovative features are a national poll system and the ability to create matchups from past or present players. Play-by-play commentary is in general quite good, although sometimes the commentator overacts his lines a little bit. The game offers a huge selection of play options to choose from, although they are by no means as sophisticated as Tom Landry or the perennial favorite NFL Challenge. Overall, All-American College Football strikes a nice balance between being an easy, accessible game and a deep sport simulation... although it leans more toward the former. If you want a quick game of college football and don't care much for minutiae or extreme realism, this may just be your cup of tea.